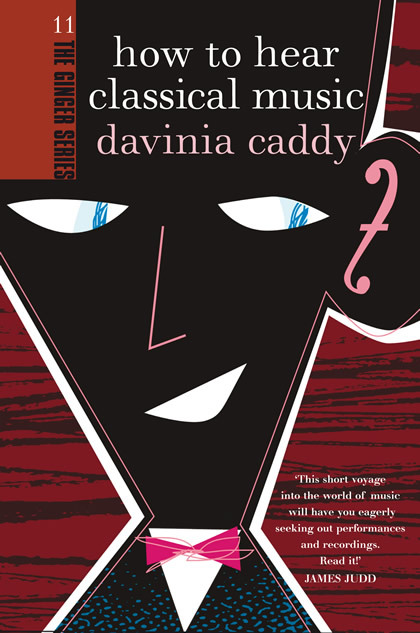 How to Hear Classical Music, by Davinia Caddy, (Awa Press, 2013), 145 pp., $24.99. Over the last nine years, the eleven instalments of Awa Press’s Ginger Series have attained the status of cultural taonga. There has been a cultural expansion too, since Spiro Zavos discovered ruck ‘n’ roll between the goalposts in his How to Watch a Rugby Game, though back in 2004, launching the Ginger trail with this book, Zavos did draw some rather forced connections between his subject and the world of finer culture. In fact, Caddy had taken up her Auckland post in 2009, and I remember her particularly slick and fulsome introduction to an Arvo Pärt concert, staged by the School of Music in August 2010. At one point the audience was exhorted to ‘take a moment and get sucked in.’ I’m still wondering what she actually meant. The English-born Caddy is the author of an impressive tome titled The Ballets Russes and Beyond: Music and Dance in Belle-Epoque Paris, but she does not deal so convincingly with culture on our side of the globe. She resorts to fuelling her arguments with quotations such as ‘the elevating power of the New Zealand landscape’, which is actually taken from a Naxos CD booklet, and tells us that Lilburn’s Aotearoa Overture is in fact a symphonic poem! Worse is yet to come. Lilburn was made aware of serialism through the music of Karlheinz Stockhausen, Caddy tells us, when in fact he would have looked to earlier innovators. She goes on to say that this symphony is his ‘last excursion with traditional instruments (from now on he would compose only electronic music). This breezily inaccurate comment overlooks the Second Piano Sonatina of 1962, the Nine Short Piano Pieces of 1965-66 and the Seventeen Pieces for Guitar of 1969-70, all of which have been released on readily available commercial recordings. The music and the musical experiences of this country do not figure prominently in How to Hear Classical Music, even if the book opens with Caddy and her partner checking out the Auckland property market. In one prospective home, she comes across a full orchestral score of Massenet’s opera Esclarmonde on a piano, describing the piece as ‘little known and long forgotten.’ Not quite. Many opera enthusiasts are familiar with it through its successful revival featuring the late Joan Sutherland. And once Caddy has dealt with the mysterious appearance of this obscure score sitting on that old black upright piano — a delightfully written episode, it must be said — she returns to England for most of her seminal musical experiences. Compare this with her Awa Press colleagues, Nick Bollinger and Justin Paton. Bollinger, in his 2004 How to Listen to Pop Music, sets off with schoolyard memories of listening to the Beatles, the Supremes and Dinah Lee; later, as a student at Wellington’s Onslow College, his life is turned around by seeing the Woodstock movie. Paton, writing a year later, in How to Look at a Painting, opens in the ‘artroom’ of his grandmother, complete with a china cabinet containing a ‘yellow strata of Auckland Weekly News.’ Paton’s book would be a fraction of its length if New Zealand painters were removed. His list of ten of the best (of the day) zigzags from Michelangelo through Frances Hodgkins to Judy Millar. After devoting three rather unsatisfactory pages to Lilburn, Davinia Caddy does not delegate much space to other New Zealand composers. The high-profile names of John Psathas and Gillian Whitehead are tagged on a quick roll-call of ‘today’s celebrated and successful crew’; so is Gareth Farr, whose 23-year-old score, Kembang Suling is allotted its own short paragraph as one of ten pieces that she would like to hear over the telephone while on hold. Most of Caddy’s experiences are linked to her European background, beginning with a young lad playing Beethoven’s ‘Für Elise’ on a beat-up piano near London’s Millennium Bridge. Later, a remarkable amount of space is given to composer Paul Whitty, a former academic colleague of Caddy, whose music is scantily represented on iTunes, which one might imagine would be a major resource for interested readers of this book. Even more disturbing is the fact that, in a list of CDs at the back of the publication, two of the 20 titles feature Whitty — along with a copy of Hooked On Classics and a venerable 1968 recording of Vivaldi’s The Four Seasons with Salvatore Accardo as soloist. Even if we excuse some alarming gaffes —Vaughan Williams is hyphenated, and there is at least one grammatical lurch when agreement goes awry — the book’s failure to lock its story more securely into New Zealand Aotearoa in 2013 is disturbing. And no amount of relentlessly bright and chirpy prose will atone for this. Numerous ‘connoisseurs’ (as the Listener describes anyone with taste, discernment and expertise) have expressed worries about Caddy’s flippant treatment of contemporary music, drawing attention in particular to the following statement: ‘Many devotees of classical music would prefer to trek north with ice axes and crampons than journey into the sound worlds of, say, Mauricio Kagel, György Ligeti or Iannis Xenakis.’ Where might these devotees be headed? Cape Reinga? With ice axes? Once again, the extreme Euro-bias of the book is revealed. But then perhaps the central problem is that Caddy is not such a fan of the concert hall itself, launching a full-scale attack on this traditional venue. ‘Concert halls are dark,’ she avers. ‘They have no windows.’ Immediately, I think of how pleasant it is, in summer, to enjoy an Auckland town hall event with light streaming through its large Victorian windows. In any case, the auditorium is rarely so dark that printed programmes are unreadable. She moves to seating. ‘Sometimes we sit, often cramped and uncomfortable, wearing fancy outfits that weren’t supposed to get creased,’ she complains. All the more reason, I would imagine, for going home to a good session with Verdi’sRequiem. Yet these venues have many virtues, one being that of acoustics. And, despite all her misgivings, Caddy did write at some length, and with enthusiasm, on that 2012 NZSO concert. She ends her story in a good old-fashioned (and dark) opera house – despite all the eccentric digressions that have gone before, which range from numerous pages on the dry and academic American electronic composer Milton Babbitt to the eco-fad for ‘recycled’ instruments, always good for filler on 24-hour television news channels. In these last few paragraphs of How to Hear Classical Music, Caddy returns to her childhood, experiencing a production of Madame Butterfly, along with an old woman who is moved to tears by the opera. It is a charmingly-written vignette, but how much more powerful it might have been if she had been a rural youngster in 1967, introduced to the power of Puccini by the touring New Zealand Opera Company. WILLIAM DART is a music critic, and a former university lecturer in music, who contributes regularly to Radio New Zealand and to the New Zealand Herald. He is also Editor of Art New Zealand.